The tapping of rubber from rubber trees growing wild in the Amazon rainforest is still an important economic activity in the region. It is a vital part of the livelihood for many families living in the rainforest, often in very remote areas, especially in the Brazilian state of Acre, and in parts of Bolivia and Peru. 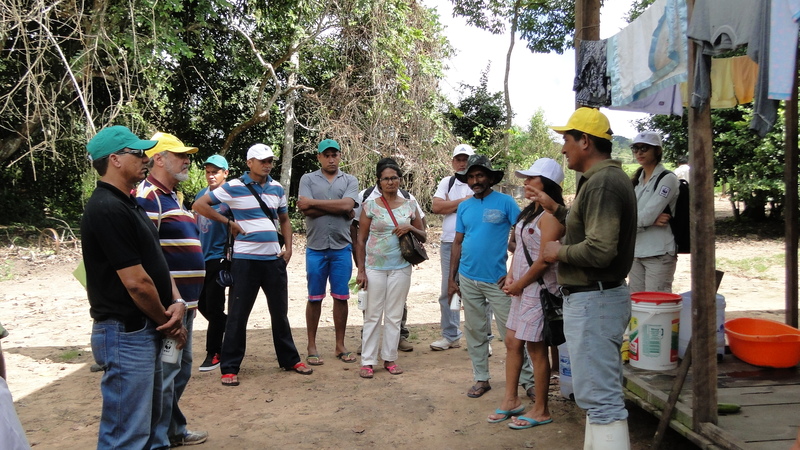 In order to boost the sustainable production of wild rubber from the Amazon, WWF staff from Brazil, Peru and Bolivia jointly organized an exchange of experiences between rubber tappers from the three countries at the end of May. 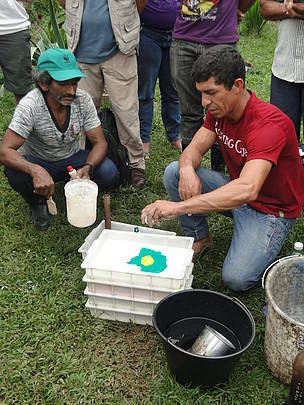 We believe this is the first time that rubber tappers from different parts of the Amazon have been able to come together to share their knowledge and discuss the future of their trade. WWF is supporting the production of wild rubber, as it is one of the rainforest products that help underpin forest conservation, by providing a natural, sustainable harvest that can benefit local people. The exchange looked at how wild rubber is tapped, processed and marketed by the different participants. 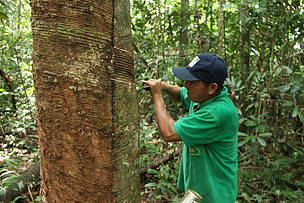 The challenges and the opportunities of wild rubber production were also explored. The exchange brought together 32 people, including rubber tappers and representatives of groups that provide them with support. 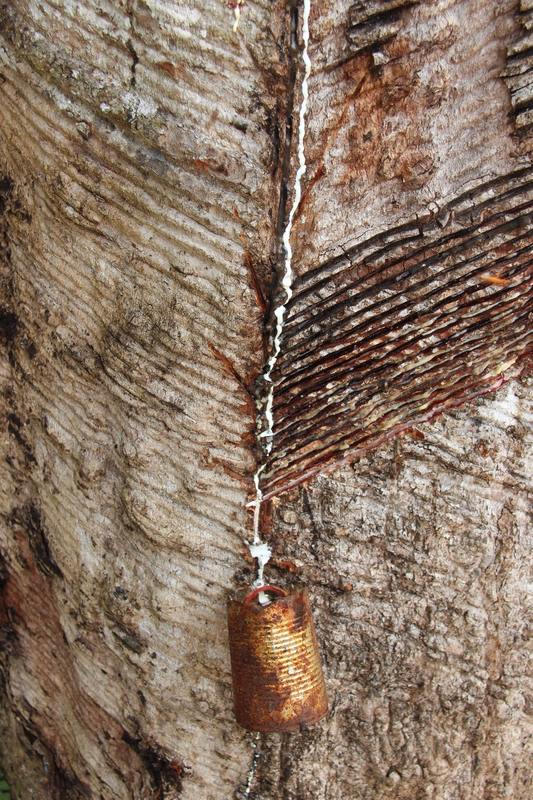 The way the rubber tappers work with the raw material – latex - can vary quite a lot from place to place. Tappers in Acre have experience of producing a type of high-value sheet rubber, known as FDL in Portuguese. This type of rubber is used for the manufacture of shoe soles and other products. One of their buyers is shoe firm Veja, that uses the rubber in its shoe soles. One rubber tapper, known as the “master of rubber” José Rodrigues de Araújo, manufactures shoes that are 100% wild rubber. These are made from coloured sheets of rubber, known as FSA rubber in Portuguese. He sells the shoes in São Paulo and Brasilia, and even has an outlet in Europe. Last year, Joseph exhibited his work in a design fair in Milan, Italy. For tapper Francisco Pinto Filho, aged 57, the exchange was very productive. "It was a a very good programme. I learned many things that I can take home and share with my community"he said. He lives in the county of Feijó in Brazil, an area that makes up part of the Sky Rainforest Rescue project area. To Peruvian tapper Saturnino Cuchama, "exchanges are good because we always learn." "For us, from other countries, it is very important to understand how you Brazilians make the processes of you. We learned a lot, seen a lot, "he said. 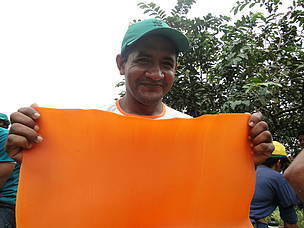 Saturnino is a director of Ecomusa, a cooperative of 24 rubber tappers working in the town of Iberia. They receive technical support from WWF-Peru and have a contract with a company called Piola that manufactures shoe soles with the rubber produced by the cooperative. Ruben Santos Cruz, another participant in the exchange, is Director of the Forest Complex of Pando Province in Bolivia. "Everything we're seeing will help us improve the lives of Bolivian rubber tappers. With what we are learning we can improve our prices, improve our processes and try to create new products, "he said. 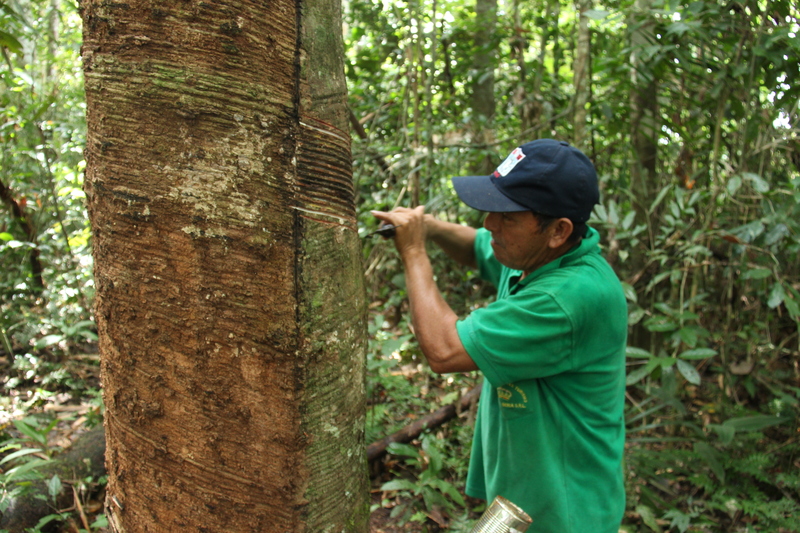 For conservation analyst at WWF-Brazil, Kaline Rossi, the exchange sought to demonstrate the different realities that exist for rubber tappers. "Many of them live in the Amazon in isolated areas and hardly leave their communities. So, we wanted to address not only the issue of the rubber, but also show other things that can help them live responsibly and generate income from the forest, such as tourism and agriculture. We also wanted to offer something that would enrich the participants not only professionally, but personally". For Edith Condori, of WWF-Peru, working with wild rubber is also about working with cultural identity "More than talking about markets, it is important to remember that wild rubber tapping is a way of life – it’s a strong cultural issue, it’s the identity of a people," he said. The exchange was made possible thanks to the Sky Rainforest Rescue project, a partnership between WWF, the government of Acre, and Sky. Initiated in 2009, the partnership promotes actions that help rainforest families to generate sustainable incomes by selling products such as acai and wild rubber. Valuing the rainforest in this way helps combat deforestation in rural properties.The project’s goal is to help save a billion trees. In 2013 the project won the award for "Best Social Organization Partnership" in Business Charity Awards in London.